On October 1st, 2018, Acxiom, one of the world’s largest data brokers, sold its Acxiom Marketing Solutions (AMS) division to the advertising giant Interpublic Group (IPG) for US $2.3 billion and consolidated its resources under its subsidiary brand, LiveRamp. AMS is Acxiom’s legacy data broker business. AMS collects data about consumers and aggregates them into target categories then sells these consumer lists to interested marketers. The acquisition of AMS marks a huge investment for IPG. With the advertising industry’s increasing reliance on data, owning a data broker obviates the need to spend large sums of money acquiring these services outside the company. Acxiom’s operations will consolidate under its subsidiary brand, LiveRamp. LiveRamp bills itself as a software-as-a-service (SaaS) operation, offering software to help marketers and companies make the best use of their existing datasets. This blogpost explores what Acxiom Marketing Systems and LiveRamp both do, and attempts to answer some questions: Why did LiveRamp (formerly Acxiom) decide that now was a good time to sell AMS? What operations does each company have in Canada? What does Acxiom Marketing Solutions do? AMS collects data from public records (such as the Canadian census), surveys, website cookies, and various other sources. It aggregates and sorts this data into different audience categories. This sorting goes far beyond simple demographics. Bruce Schneier, an American privacy expert, wrote in his book Data and Goliath that Acxiom’s complex categories include: “potential inheritor,” “adult with senior parent,” or “households with a ‘diabetic focus’ or senior needs.” They can then sell lists of persons who fall into those categories to parties who are interested in catering to those markets. In acquiring AMS, IPG has obtained not only the ongoing resources of one of the world’s foremost data broker firms and its 2100+ employees, but also data on 2.2 billion consumers worldwide and the ability to exploit that data for its marketing and advertising campaigns. With the sale of AMS, the rest of what was once Acxiom has consolidated under the LiveRamp brand. Rather than collecting its own datasets, LiveRamp sees itself as a software-as-a-service company that helps make the most of its customers’ existing datasets. LiveRamp’s primary service is something called “data onboarding” or “offline matching.” Essentially, this is the process of connecting offline data (e.g. information about members of a loyalty card program) to online identifiers and patterns of activity derived from online tools like cookies and Facebook and Twitter accounts. Why is LiveRamp/Acxiom selling now? If the resources of AMS are formidable, why did its parent company sell it? After all, of Acxiom’s three divisions, AMS generated the greatest portion of the company’s revenue. The sale was not a surprise. In February of this year, Acxiom announced as a part of a strategic review that it was looking to sell AMS and consolidate its assets under LiveRamp. Some commentators in the advertising industry anticipate that in time, LiveRamp itself will be sold as a highly valuable asset on its own. The shifting privacy landscape may be one of the drivers behind the decision to sell. As the public becomes more aware of how data is shared by data brokers, businesses like AMS and LiveRamp are coming under increased scrutiny. Facebook cut its ties to Acxiom and several other large data broker firms in March, causing Acxiom shares to tumble 34%. Strong privacy regulations, such as the GDPR, are becoming the norm, requiring clear explicit consent from consumers before companies can gather their data. LiveRamp, as a provider of services that interprets already existing data, might be regarded as a “processor” of data under the GDPR and not a “controller” of the data, exposing them to less risk of regulation than AMS. AMS, on the other hand, is decidedly a “controller” of its data as its core functions are to collect, retain, and process consumer data. As GDPR application ramps up and other jurisdictions adopt similar laws, whether a company “controls” or merely “processes” data will undoubtedly impact the earnings of companies that operated in this previously under-regulated space. Further clarity on what this means to Canadians was provided to the Standing Committee on Access to Information, Privacy and Ethics years prior to Acxiom’s sale of AMS. Acxiom’s representative testified before the Committee in 2012 that Acxiom’s full range of products is not available in Canada, and Acxiom only provides “business and consumer telephone directory products amounting to just under $1.5 million in annual revenue.” She went on to say that the services they provided in Canada only match names, addresses, and telephone numbers based off of telephone directory listings, and append census data to this data based on geography. While their US offerings identify social media usage and what types of social media each individual users use, they claimed not to deploy such offerings in Canada. However, they do provide the information they have to social media sites as well as their other clients. All of this is managed from their office in Little Rock, Arkansas. The divestiture of AMS has an unclear effect on how AMS’s activities fit within the broader advertising industry’s opt-out mechanisms. The Digital Advertising Alliance (DAA) and Digital Advertising Alliance of Canada (DAAC) both offer an opt-out system that allows one to opt out of tracking cookies from all of their member organizations (including Google, Microsoft, Facebook). However, this needs to be done on every browser and device used by each consumer. There is also an app distributed by the DAA that allows consumers to opt out of their targeted ads in mobile applications on Android and iOS devices. 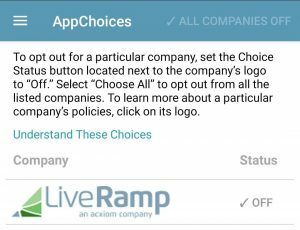 The LiveRamp logo still carries the tagline, “an acxiom company” in the DAAC’s AppChoices app. With the divestiture of AMS/Acxiom, LiveRamp’s operations in Canada appear to be limited to its formidable “data onboarding” services, and it is doing well: LiveRamp is the most used service of its kind in Canada, with a 23.55% market share of Canadian websites. Thousands of Canadian businesses use LiveRamp to provide targeted ad content, including CBC, the Globe and Mail, the National Post, and TSN. The sale of Acxiom Marketing Solutions to the Interpublic Group may be indicative of a couple of important trends in the data brokers industry. First, it signals an increasing awareness from marketers of how much of their modern techniques rely on data brokers and a willingness to spend billions on bringing those capabilities in-house. Second, it shows that data brokers are aware that their operations are coming under increasing scrutiny and regulation. Some data brokers may begin transitioning to business models that are on safer legal territory. For Canadians it would appear that AMS’ operations are limited in scope. LiveRamp’s services, however, appear to be in use by many different websites catering to Canadians. Opting out requires that consumer awareness of how to opt out. As noted in our previous blogpost on the Oracle Data cloud, a 2016 survey conducted by the Digital Advertising Alliance of Canada indicated that only 38 percent of 1000 Canadians interviewed recognized the AdChoices logo. The majority of Canadians are still not aware of the program nor aware of their ability to opt out of targeted advertising.